Two historic Duesenbergs from five decades of single ownership are amongst the highlights of the RM Sotheby’s 10th anniversary Hershey, Pennsylvania sale. The 1930 Model J Dual-Cowl Phaeton, J-347, also known as the “Mexico Model J Duesenberg” has a pre-auction estimate of $1,600,000 – $2,000,000 while the 1927 Duesenberg Model A/Y Phaeton Prototype is expected to sell for a more modest $450,000 – $550,000. Around 120 cars will be on offer with a strong selection of American cars from the pre-war era. RM Sotheby’s will hold its tenth Hershey sale on 6-7 October 2016, alongside the Antique Automobile Club of America’s renowned Eastern Division Fall Meet, at the Hershey Lodge in Pennsylvania, USA. Around 120 lots will be on offer with a strong selection of American-made cars from before the Second World War with many dating from before the First World War period. Several historic motorcycles will also be on offer. 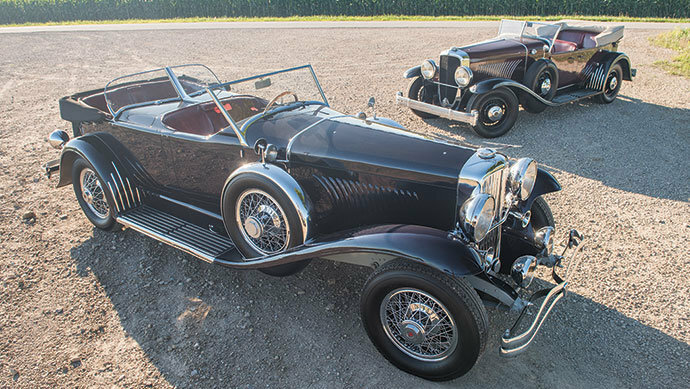 Two historical Duesenbergs are the among the highlights of this auction: a 1930 Model J Dual-Cowl Phaeton, J-347 and a 1927 Duesenberg Model A/Y Phaeton Prototype. The top result is expected to come from a 1930 Model J Dual-Cowl Phaeton, J-347, one of only three Dual-Cowl Phaetons originally bodied to coachbuilder Walter J. Murphy’s stunning open design. Of this select group, J-347 boasts the purest and most fascinating ownership history, dating back to its very first caretaker, John F. Howard. Typical of the interesting men who owned Duesenbergs, Howard was famous as “the Mayonnaise King,” having made millions from a line of salad dressings produced to his wife’s recipes in Massachusetts. He later relocated to Mexico, where he took delivery of what would become known as the “Mexican Duesenberg”. Following a succession of short-term Mexican owners that included a film studio, the car’s last Mexican owner placed J-347 into storage in the parking lot of the Mexico City airport, where it remained—surrounded by a short brick wall—until discovered by late Duesenberg historian Raymond Wolff in 1962. Wolff promptly purchased the original automobile and brought it back to the United States, soon after selling it to the father of its current owner, with whose family it has remained for a remarkable 54 years. It comes to Hershey sporting its well-preserved, original restoration, mirroring its appearance when displayed at Hershey in October, 1963. Aesthetically, J-347’s dark purple finish and red leather interior have an appealing rich patina; a wooden steering wheel from a 1930s Mercedes-Benz, a feature the car has donned for decades, adds additional character and has become something of a signature. Wonderfully pure, original and rarer than its contemporaries, J-347 has made several appearances at concours d’elegance and at the ACD Club National Reunion over the years. It comes to auction an ideal candidate for a renewed show career or for enthusiastic driving in vintage events (Est. $1,600,000 – $2,000,000). The 1927 Duesenberg Model A/Y Phaeton Prototype, has a similarly interesting history to tell. After acquiring Duesenberg Motors in 1926, E.L. Cord, along with founding brother Fred Duesenberg, set out to build the world’s greatest automobile. They put together a prototype, dubbed the Model Y, using the chassis of the Model A and a prototype engine based on the Model A’s SOHC unit evolved for a reported output near 200 hp. Two examples of the Model Y were produced, each with prototype styling developed by the brilliant Alan Leamy. The first car, a sedan, was delivered to actor Frank Morgan, best known for his title role in 1939’s The Wizard of Oz, though it unfortunately did not survive the Classic Era. The second car, a phaeton bodied by McFarlan, was sold in 1932 to Fred Duesenberg’s brother August, the genius racing mechanic, on the condition that he destroy the prototype chassis. After doing just that and moving the engine into a racing car that still survives today, “Augie” installed the full McFarlan bodywork on a used Model A chassis, no. 912, and sold the car to Indianapolis businessman Hugh R. Baylor. Following Mr. Baylor’s passing, the Model A/Y remained with his family until 1951, when it passed through the hands of James T. Leeson, who overhauled the car mechanically and cosmetically before selling it to the father of its current owner in 1957. It has since been conscientiously preserved by its third family owners for nearly six decades, during which time it has been on long-term display at the ACD Automobile Museum in Auburn, Indiana. One of the most historically significant Duesenberg in private hands, it comes to RM’s Hershey sale presented as it was when sold by Augie Duesenberg in 1932 (Est. $450,000 – $550,000).